Do you wonder if denim is the right choice for your project? 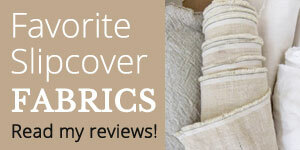 Below I answer your most frequently asked questions about one of my favorite slipcover fabrics. Does denim work better than canvas for a slipcover? For my own slipcovers I use washable, cotton denim more often than cotton canvas because I like the appearance better. I like the twill weave texture as opposed to the flat look of canvas. Denim also has less wrinkle than canvas. Both denim and canvas are strong, versatile fabrics that make a good looking and durable slipcover. Consider the look you’re going for, your budget and what kind of use your slipcover will get. Buy a yard of each denim and canvas you like, wash them and throw them over your furniture to see which one speaks to you. Will un-dyed natural denim cover my dark color upholstered furniture? Heavy weight 14 oz. natural denim does a good job at covering dark colors. Most 12 oz. denims will, too. I recommend testing a sample to be sure. What type of denim holds up best to kids and pets? A heavy weight 14 oz. denim will be the most durable and can take frequent washing. It makes a very substantial slipcover. Some 12 oz. denims will also work well. Both yarn dye denim and bull denim will work as long as they are heavyweight. I don’t recommend denim that is lighter than 12 oz. for high traffic slipcovers. Is $18 denim better quality than one that is half the price? Price doesn’t always reflect the fabric’s quality. I bought a $10 natural denim and liked the quality much more than a more expensive one I had. I have also purchased discount denim and was very disappointed with the amount of flaws and extremely high shrinkage. You can find out a lot about the fabric quality by doing a wash & dry test on one yard. I bought denim that is pre-washed. Do I have to pre-shrink it before making my slipcover? Yes! A fabric labeled “pre-washed” means the fabric has been finished in a way that makes it feel soft and supple. It doesn’t mean all of the shrinkage has been removed. Be sure to pre-shrink your denim yardage so your slipcover doesn’t shrink later on. I found a denim I like but its Dry Clean Only. Can it be washed? The best way to find out is to wash test a yard. I have washed many dry clean only cotton denim fabrics and most of them turned out great. Sometimes they shrink more or fade easier than a washable denim so be sure to test a sample before you commit to a lot of yardage. The indigo denim I bought feels very stiff after I washed it. How can I soften it? Frequent washing will relax the fabric over time but it probably will never feel like a soft and supple “pre-washed denim”. Special chemicals and wash treatments are applied to the denim during production. These cannot be duplicated in a home laundry. In lieu of chemicals, I have tried vinegar, fabric softeners, dryer sheets and dryer balls to soften stiff denim without success. When shopping for denim, don’t confuse stiffness with weight. Denim that feels very stiff or rigid doesn’t always soften after it’s washed and might wrinkle like crazy. This entry was posted in Uncategorized on June 5, 2017 by slipcovermaker.